I hope you never become a member of our quickly expanding club. But as someone all too familiar with the hurricane/flooding/seepage drill, I have some tips for the newcomers to our unfortunate alliance. 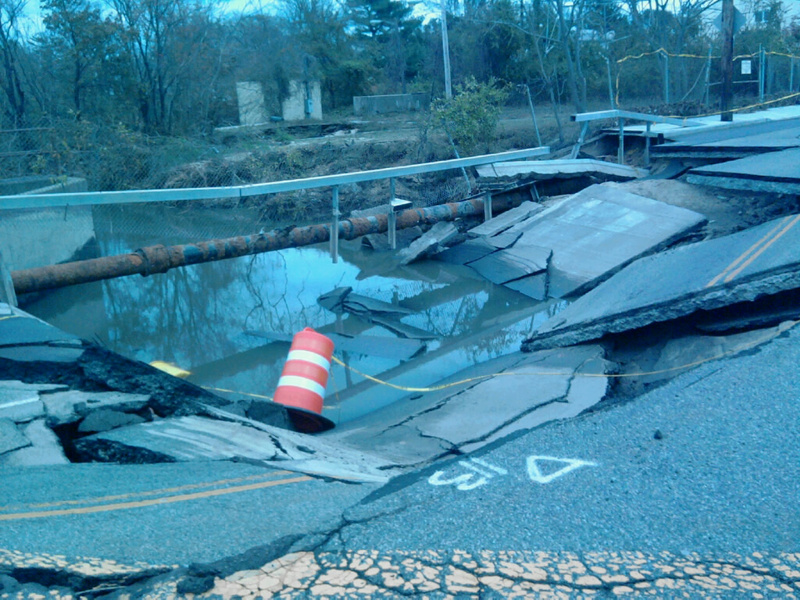 We flooded out in Hurricane Irene and then got hit again, less than one year later, during Hurricane Sandy. The first thing you’ll need to do is throw away your furniture, all your soggy remains of irreplaceable keepsake memories, your precious photo albums, rugs, clothing, shoes, computer monitors, appliances, pretty much everything. Then, remove all affected drywall, which for us always meant “to the studs.” Look it up. Carefully lug and pile the thousands of pounds of the putrid, sodden remnants of your belongings into a mountain shape to avoid your used-to-be valuables from spilling onto the street. And most importantly, immediately eviscerate the quickly growing black mold that will undoubtedly pop up and spread out. It’s nasty and hard as hell to get rid of. If you can afford an expert to take on the removal task, I recommend that you do so. Any attempt to DIY can be dangerous. If the black mold doesn’t mess up your breathing, the bleach and other chemicals you will need to use to annihilate it will surely wreak havoc on your lungs. Oh, and keep a close watch out for termites. I learned the hard way that they love wet wood, duh. 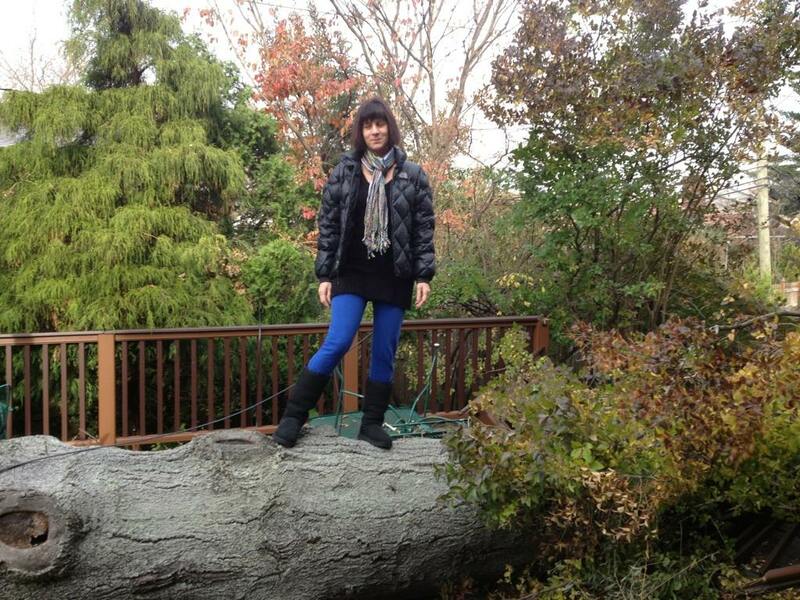 When Hurricane Sandy made landfall on October 29, 2012, it frighteningly and ferociously plummeted our house. As the water swiftly raged down my usually quiet street, it carried metal generators, garbage cans, huge pieces of wood and tree branches, and nearly covered the parked cars. My husband and I were alone and regretting our decision to remain in the house. As the water lapped onto our lawn in waves, it inched closer and closer to our front door. We were in a panic, and grabbed towels and sheets from our linen closet, and stuffed them against our front and garage doors. The linens didn’t work out so well. The water seeped into our garage but mercifully stopped at our front door. That was the nightmare happening in the front of the house. In the back of the house, right off our kitchen, I was monitoring the movement of the 70 foot Oak tree in my neighbor’s back yard. The wind was howling through the tree’s 100-foot canopy, causing it to whip back and forth in the wind, like a weed. And there was no doubt that it was precariously thrashing and bending in the direction of our house. Water was gushing onto our property in the front of the house, and a ginormous tree was readying itself to come crashing down on us in the back. I was feeling panicky, but I wanted to appear in control of the situation. It was my stupid idea to stay put. Then our electricity went out so we could no longer see the torrent of water in the front of the house. I guess that was a good thing. But it wasn’t dark enough in the back of the house to camouflage that damn solid Oak tree literally pulled from its roots, and looming in our direction. I strongly suggested to my husband that we go up to our bedroom, which was the highest room in the house, to escape the treacherous storm surge. He adamantly disagreed and suggested we go down into the basement. He was fairly confident that if the tree came down, it would in all probability crash into our bedroom. I reluctantly agreed with his analysis. But the basement? 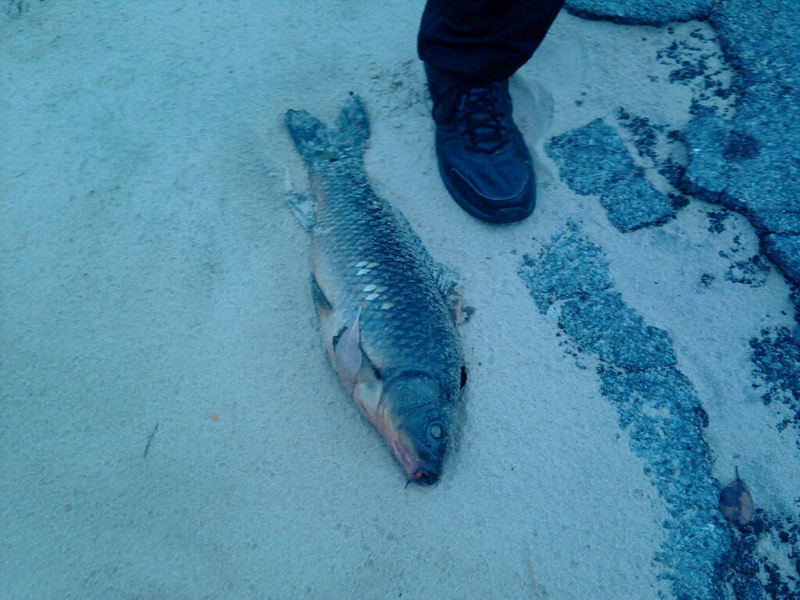 The water was heaving itself onto our front lawn in wave after wave, and he wanted to move in the downward direction? It was a surreal conversation. Do we take our chances in the basement and hope that the water wouldn’t crash through the windows and drown us? Or do we move to higher ground and chance getting gored by Oak tree branches? As we argued in the hallway about whether we should go up or down, there was a massive crash in the back of our house, which sent a shock wave through the entire structure. As we crept up our stairs, we saw bright crackling and spits of flame through the kitchen window. That not so grand old Oak lay a mere three feet from our house, which was a miraculous thing. 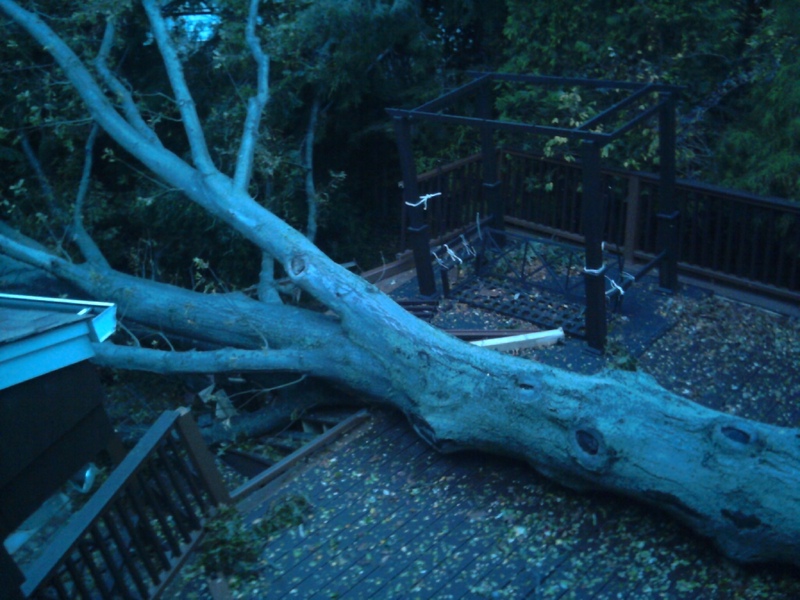 The 70-foot behemoth with its 100-foot canopy had smashed onto our property, taking fences, trees, electrical lines, our deck, and everything else in its path with it. It also took off a small piece of our jutting roof, but the rest of our house and our lives had thankfully been spared. The next few days were nightmarish. But as a member of the Hurricane Club, we had been down this devastating road before. So we began the arduous task of cleaning up. Except one week later, we had an early season snowstorm which dumped more than a foot of snow on us. Fortunately, the coastal flooding from the storm was minor, but it brought any hope of recovery to a screeching halt. 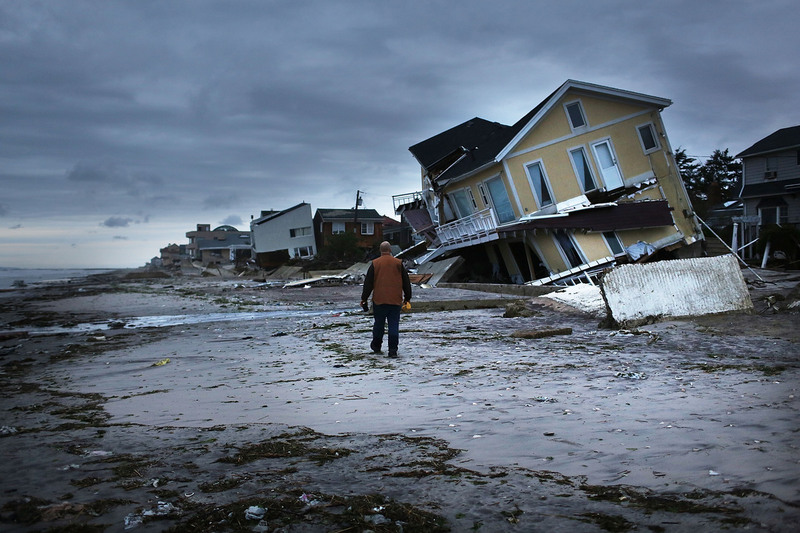 Immediately following Hurricane Sandy, gas stations were out of gasoline, there were slim pickings at the only walkable grocery store, whole boulevards had been washed away, and rebuilding seemed like an impossible task. For close to three weeks we endured no heat, no electricity, and only ice cold water for showers. Thankfully our toilets were working. But our cell phones were dead, so it was difficult to communicate with the outside world. We were in survival mode. And it was freezing cold in our house. Our paltry supply of food and drinks were packed into coolers we found in our soggy garage, now strewn about on our destroyed deck. And then of course there was that damned tree, a reminder of the work ahead of us. 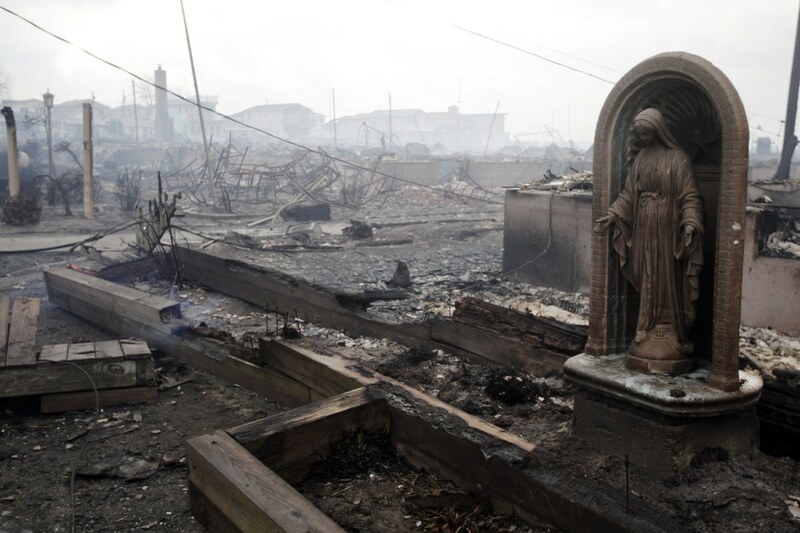 As we walked through our neighborhood, the devastation was heartbreaking. 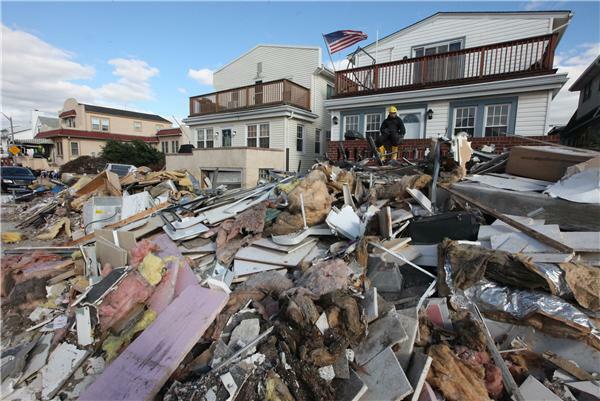 Amidst the snow drifts, downed trees cut off many of the streets, houses were demolished, rotting dead fish were oddly strewn about, and workers who had come from all over the country to assist in the recovery and rebuilding were assessing the damage. 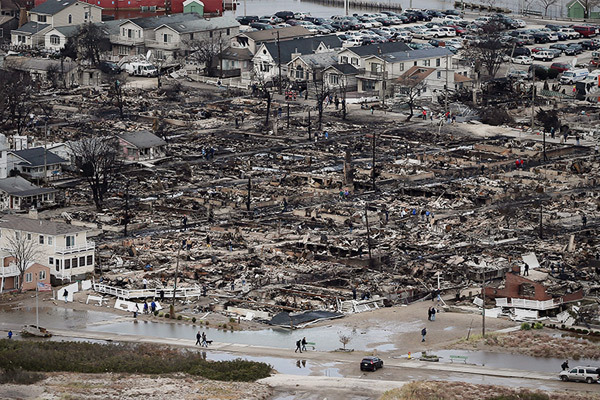 Reminders of Hurricane Sandy are still everywhere. Five years later, many victims are still recovering and rebuilding. With the arrival of Harvey and Irma, the Hurricane Club will sadly be expanding its membership. Irma, who has already ripped through the Caribbean, now has her sights on Florida. As someone who survived Sandy, I would strongly advise anyone in Irma’s path to get the hell out of dodge. And then courageously prepare for the new normal.